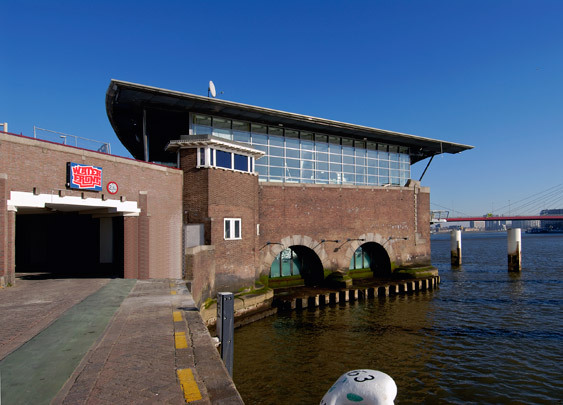 The visible portion of this leisure-time facility, the result of exploiting the existing situation with great artistry and technical acumen, is a composition of lightweight materials set in the abutment of what used to be the Willems Bridge over the river Maas. The abutment combines a pier standing in the river with arching walls linking it to the bank. This space lies at quay level, whereas the theatre with dance floor sits below it flush with the river. Here the gaps between the arches have been given a spectacular glass infill.